Here are the answers to a few of our most often asked questions regarding our garden supplies delivery service. Product prices included standard delivery to most postcode areas, any delivery charges or available upgrades will be shown in the check out when you have entered your delivery postcode (click "Check Delivery Options" button in the checkout). We deliver goods Tuesday to Saturday, Saturday deliveries do carry a surcharge. Do you deliver Next Day? Yes we offer a next day delivery service as a delivery option in the checkout. Orders placed before 2pm can be delivered next day if this option is selected. 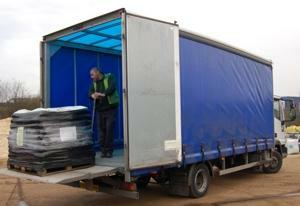 Most of our products are delivered on a pallet (with the exception of smaller goods such as accessories and tools). Pallet delivery can only be guaranteed to your kerbside. The pallet is delivered from a wagon with a tail lift and pallet trolley (not a crane wagon), if you have any queries please contact us on 0871 971 0988. It is only possible to manoeuvre a pallet truck on level, smooth and solid surfaces such as tarmac, concrete or block paving. Most of our products are available with next day delivery, you can select an AM delivery in the checkout. Do I need to be at home when the delivery is made? Deliveries can be left without a signature, so you do not have to be waiting at home for the delivery to arrive! Please let us know if your not going to be in. Products that are not sent on a pallet, such as tools and accessories, are usually sent by Royal Mail or Courier Service.